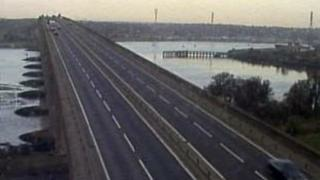 The eastbound carriageway of the Orwell Bridge was closed after a road crash. Suffolk Police were called to the A14, which passes over the bridge, at Ipswich, at about 04:30 BST to a collision between a vehicle parked on the bridge and a travelling lorry. No-one was injured in the crash. One lane of the eastbound carriageway reopened at about 08:00. Officers also recovered the body of a man found under the bridge. The death is not thought to be suspicious. One lane of the A14 remained closed while investigations took place and motorists were advised to find alternative routes to avoid traffic queues. The westbound carriageway remained open.